Today marks the last day of the rainy season here in Costa Rica. The sky was a brilliant blue and there wasn’t a cloud in sight; a nice change from the miserable weather we have had the past few days. We were zombies when the alarm went off at 5AM. It was an early morning for Joey and me as we assembled our regulators, masks and dive watches. We had gone to bed early the previous night in the hopes of being fully rested for our dive, but the mischievous coatimundi living in the condo roof had other plans. Joey and I had been looking forward to this day all week. 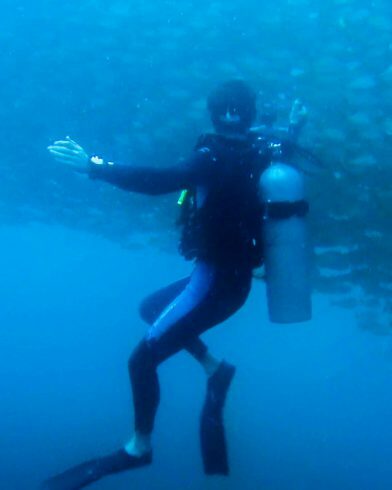 It would be our first dive together this year. We met our divemaster Carlos and a group of 5 at the Summer Salt dive shop. After the small but necessary preparations, we headed for the beach hitting the water at 6:30 sharp for the hour and a half boat ride to the dive site. Our site of interest for the day was the Bat Islands or Islas Murcielagos, a chain of islands located off the tip of Santa Rosa National Park. 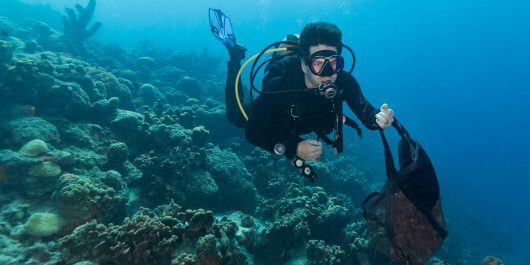 This marine protected park requires divers to have an advanced open water certification or higher due to its strong currents and rough surface conditions. Amongst the aquatic life that call this place home, the big draw to the Bat Island site is the opportunity for an up close and personal encounter with the bull sharks that rule these waters. Joey had never dove with a shark before and I was really hoping we would get to see one of these beauties. The captain steered the small vessel northward, away from the blackened mainland, leaving seagulls and white chop in our wake. With the salty Pacific sea air and rich blue skies above us nothing was standing between us and the Bat Islands, well almost nothing. 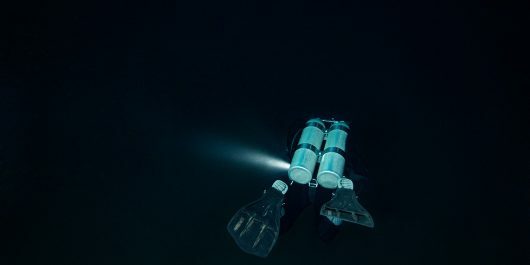 Of all the things that could go wrong, we didn’t expect it to come while making our way to the dive site. Joey and I arrived to the Big Scare dive site with our heads hung over the side of the boat. By this time we were taking turns between who would puke and who would prep the gear. All we wanted to do was get off of this topsy-turvy boat and into the cold soothing water. While preparing our gear for the dive, we were surprised when a whale blow spouted less the 50 meters from the idling boat. Almost as if in unison, the entire boat turned to glimpse the jet black dorsal of an orca sink beneath the water. Keeping our eyes alert, we watched as the orca circled and hunted in the spot where we would soon be diving. We saw its dorsal a few times before it disappeared into the depths for good. Unfortunately orca’s are one of the apex predators of the sea and have a tendency to scare most marine life off in the vicinity of their hunting grounds. We were told that there was a slim chance that we would see much at this site given its recent visitor, but all the same it was exhilarating to think that we would have an orca watching us from just out of sight. 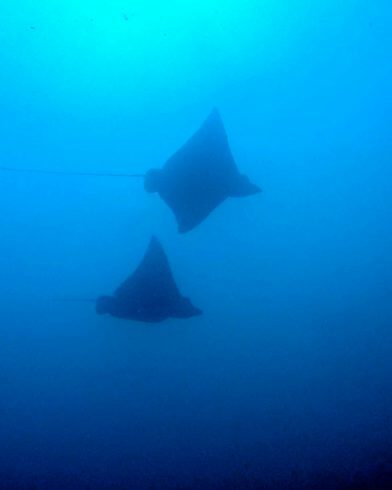 It was surprisingly peaceful underwater given the surface conditions and Joey and I were very grateful. The only place we could find some relief from our sea sickness was deeper than 5 feet. The bottom of the site was very rocky and made up of mostly lava stone encrusted with coralline algae. 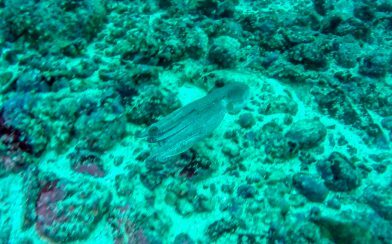 I was the first to spot a small octopus carefully concealed between two rocks. 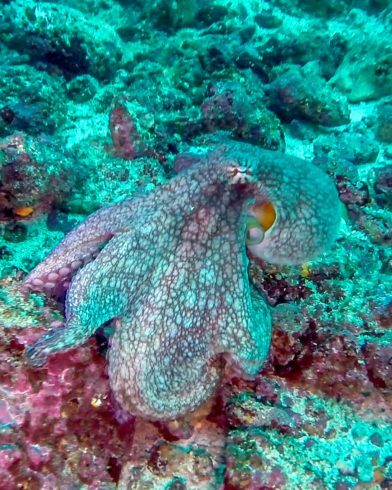 I grabbed Joey’s attention so we could get closer and check out our first wild octopus sighting. 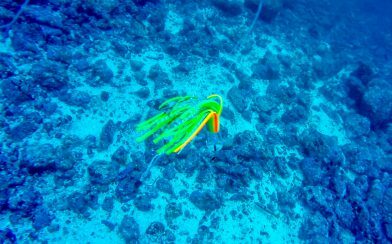 We saw a few marine odds and ends while swimming around at 90 feet but realized pretty quickly that the divemaster was right, we wouldn’t be seeing much. 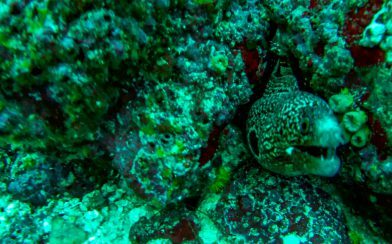 Sea stars, small reef fish and morays made up the bulk of our finds and we had a great time capturing up-close footage. 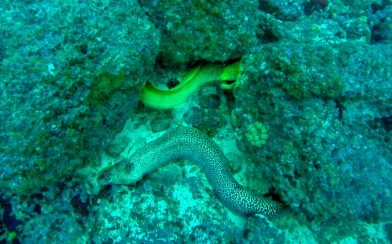 Without realizing it Joey’s hand came really close to a big green morays eerie smile while getting tossed around by some bottom current. That would have been a nasty bite! 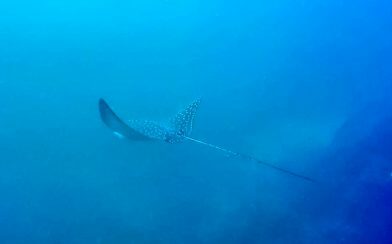 We dove the Big Scare dive site twice in the hopes that we would get to see some bull sharks but sadly none came out to play. The last dive site of our trip was called Black Rock, and it was hands down the best dive of the day although I’m sure we would have felt differently had we seen a bull shark. By dive number three we had pretty much puked everything in our stomachs up. We were slightly dehydrated and very hungry but refrained from consuming anything. 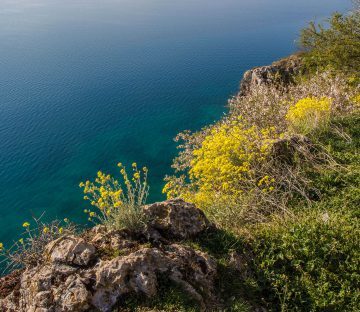 The fear of giving our seasickness more ammunition outweighed our desire to eat anything. Eager to get below water, our divemaster gave us a quick briefing on the relatively shallow site before allowing us to hop in. We descended 60 feet into the wavy water intending to spiral around Black Rock while making our way to the surface. 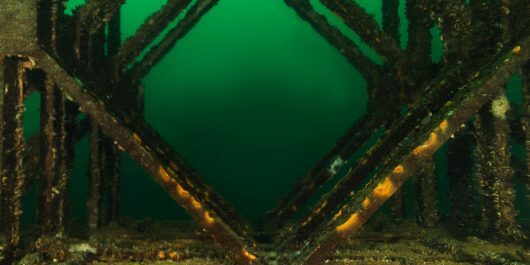 This marine rich spot had so much more to see than the previous dive site. Almost as soon as I put my face in the water I could see a flurry of activity in the waters below. Off in the distance the divemaster spotted some eagle rays flying through the water. 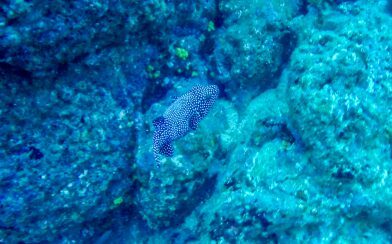 They majestically weaved in and out of our sight, their speckled bodies following us for the greater part of the dive. 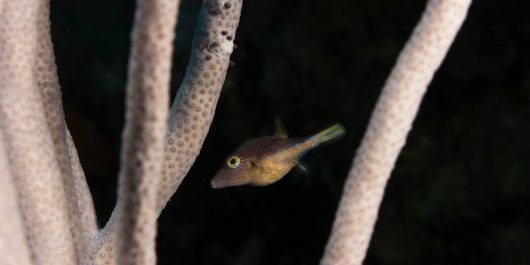 I was elated to see a handful of them fluttering by, but they kept a safe distance from our dive group. 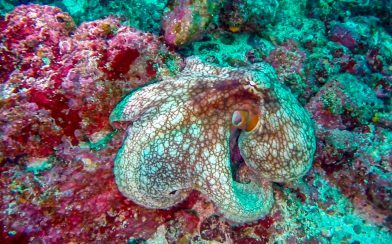 Towards the end of our Black Rock dive, nature had another treat in store us. 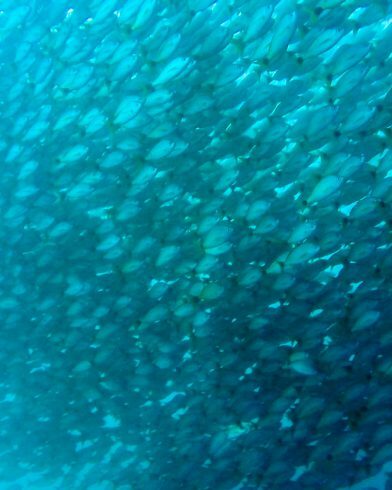 Out of nowhere a gigantic school of fish enveloped us. 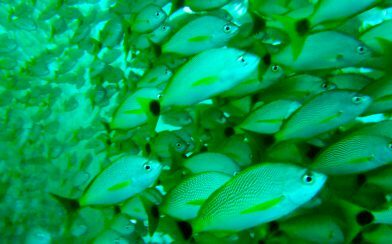 Thousands upon thousands of chere-chere grunt (Haemulon steindachneri) swarmed the waters around our group feeding and floating in the productive upwelling waters around Black Rock. 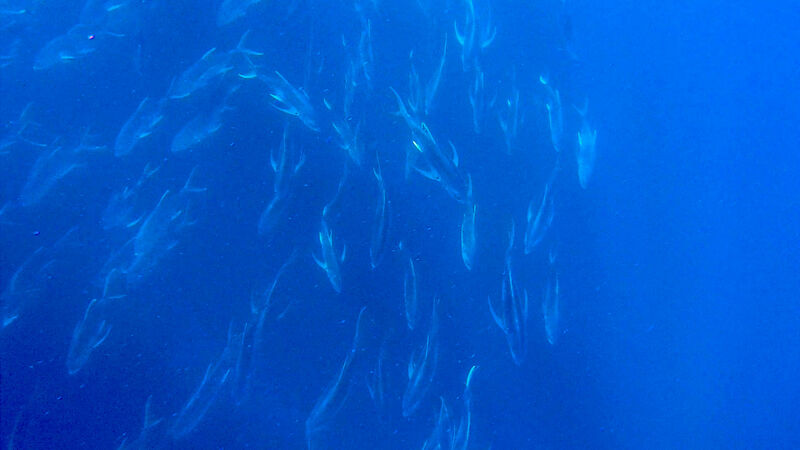 I could not help but feel like I was living in an episode of blue planet, the massive wall of fish dancing so close we could almost touch them. 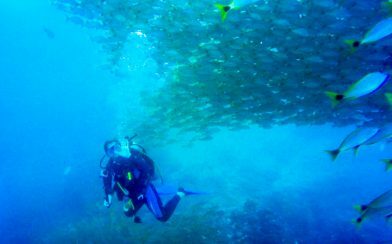 As much as we would have loved to stay underwater watching the school of grunts for hours on end, the air in our tank allowed us to enjoy this amazing sight for 15 minutes before heading up to do our safety stop. On the way back to Playa del Coco the ocean had calmed down and Joey was able to sleep off some of his seasickness. We were really happy to get on firm land after a day at sea and it took us an entire evening to rehydrate and soothe our upset stomachs. 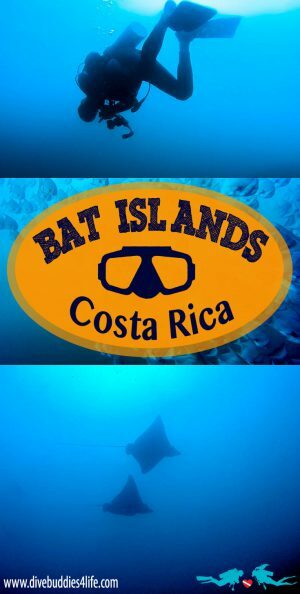 Misadventures aside, we had a rockin’ time underwater and if we ever make it back to the Pacific side of Costa Rica we will definitely retry our luck at diving with some big bad bull sharks. Cost: While we did exchange some currency into Costa Rican colóns, most of the country actually accepts American currency as well. 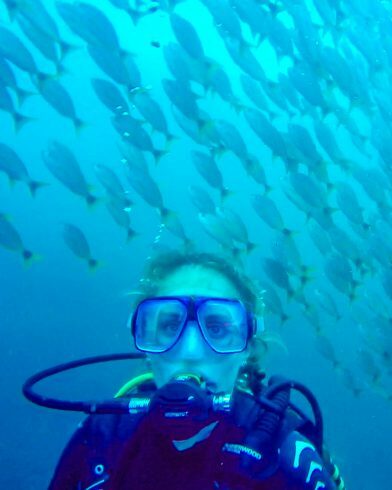 For scuba diving, you should be able to pay your excursion in American dollars or Costa Rican colóns. 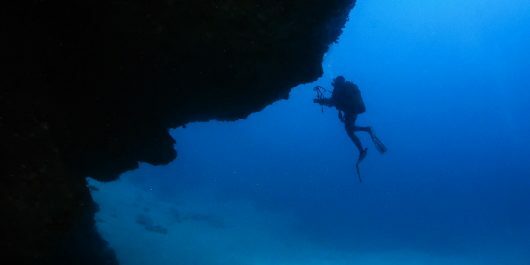 Two dives at the Bat Islands costs $170.00 USD. 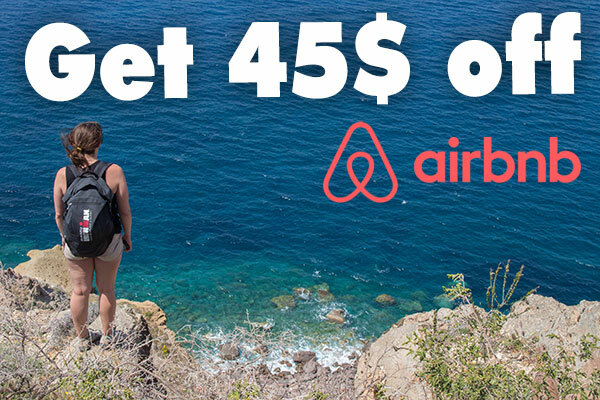 This includes tanks, weights, snacks, drinks, bilingual guide and the Santa Rosa National Park fee. 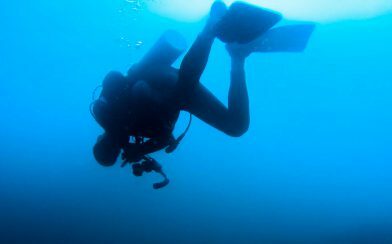 If you decide to power through three dives the cost is $200.00 USD and this includes tanks, weights, snacks, lunch, drinks, bilingual guide and the Santa Rosa National Park fee. The average price for full equipment rental comes in at about $25.00 USD for the day. 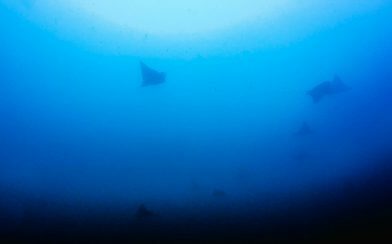 Seasonality: Most divers visit Bat Islands for one reason; to enjoy up close encounters with the infamous bull sharks. 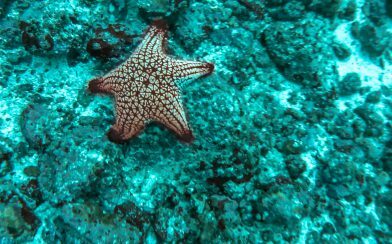 The most opportune time to do this is during Costa Rica’s green or rainy season (between the months of May-October), however you may get lucky and spot them in November too! 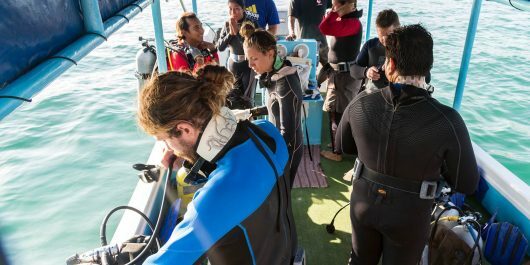 * The dive shops also requires a minimum of 4 divers for the trip to happen. 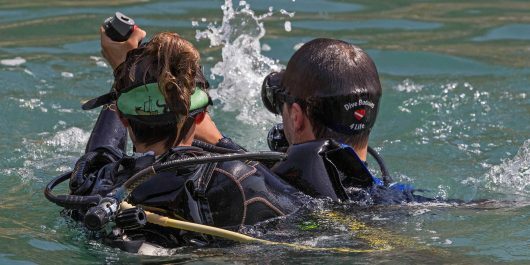 If your schedule is flexible, often times they are able to group divers together on specific days. 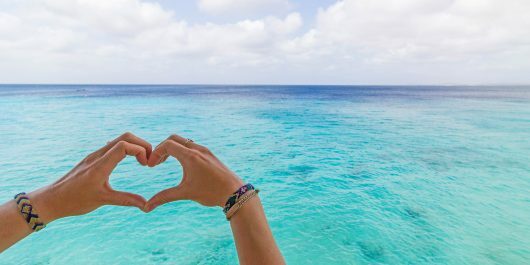 Companies: In and around the touristic town of Playa del Coco there are lots of dive companies to choose from each with its own pro’s and con’s. 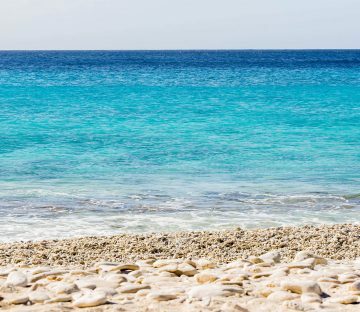 We went with Summer Salt Dive Center and were very happy with the quality of the service we received. 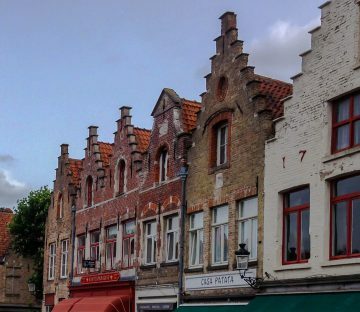 When in doubt speak with a reputable tourism agency for advice on which one you should select. 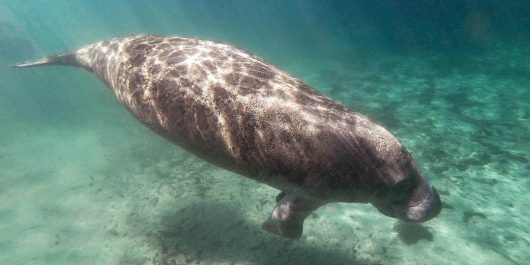 Have you ever gone into a dive with high hopes of seeing some megafauna and been let down? Tell us more.